There isn’t a clear indication that aliens are in our presence. Aliens have had more than enough time to grace us with their presence so do extraterrestrials really exist. There may be no extraterrestrials anywhere in the vast Galaxy. This could be a conclusion by a small observation but there must be a way to account for the evident loneliness we experience here on Earth. Fermi Paradox is a strong argument because the Galaxy is ancient. You can question if the speed of the alien aircraft will be fast enough to move throughout space and colonize. You can argue how long it would take to colonize a star and move on to the next one. You can ponder any possibility but it doesn’t matter because any reasonable assumption of how fast it takes to colonize would be profoundly shorter than the age of the Galaxy. Some think there is no paradox at all and the reason we don’t see any evidence of extraterrestrials is because there aren’t any at all. Why does the cosmos look so untouched and unconquered? What is keeping advanced extraterrestrials from claiming every star system in sight? Some researchers suggest that the Galaxy is colonized, but we just don’t notice.Truly advanced engineering projects would be indistinguishable from magic. Perhaps the evidence of alien presence is so beyond us that we simply don’t recognize it. Another thought is that the aliens find Earth an interesting nature park, and have arranged matters so that, while they can observe us, we can’t observe them. The idea that we may be some aliens’ high-tech ecological exhibit is called the “zoo hypothesis.” A resolution to the Fermi Paradox is and idea that we are an exhibit to alien tourists where they observe us. Yet, there is no evidence to this “zoo hypothesis,” some people argue that aliens are closer than you think. 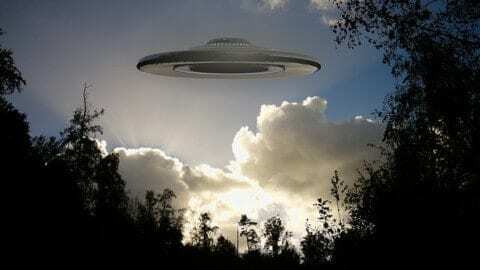 Researchers from SETI say, “Many thousands of sightings of unidentified flying objects (UFOs) are reported each year, and polls show that one-third to one-half of the population believes that at least some of these aerial apparitions are alien spacecraft.” This would resolve the Fermi Paradox. Scientists do not think this is a prevalent idea like the public but researchers are trying to collect better evidence. People have claimed to see ghosts and there are many stories of those accounts. These stories aren’t exactly convincing and you don’t read about them in scholarly journals. Until better evidence, scientists are in favor of accepting that the Fermi Paradox can be resolved by UFOs. Perhaps the universe is teeming with societies so subtle we can’t prove their presence. Or haven’t yet. On the other hand, maybe we’re alone. Aliens and UFOs by Andrea is licensed under a Creative Commons Attribution-ShareAlike 4.0 International License. If you asked me the question does alien exists? I would probably say yes. Space is to big for us to even know if alien are real or not, but I do believe that there is something else out there and we aren’t alone. You can’t really prove that aliens aren’t real because we can only travel so far we can only think so big and space is huge. I am happy you mention the zoo hypothesis I didn’t really know that that was a thing, I have thought about that theory before but I didn’t know there was a official term for it. But I believe that alien could be watching us and studying us. I really like the two points of view that you showed us. It makes us think there are two distinct sides of the story. It would have been very interesting to see your point of view. This topic is very interesting but if you think about it the aliens could be like us and are waiting for us to go and find them. They could also be way to far away to imagine that us or they do not have the technology. I really do not think we have enough evidence to make any conclusions. We just have to wait.